The yellow food coloring was good but the red turned the cake mixture green! I have no idea why. Anyway I went to a specialist cake shop and managed to track down some pink icing gel. This turned out better, but not perfect. See what you think! This recipe makes two small cakes. 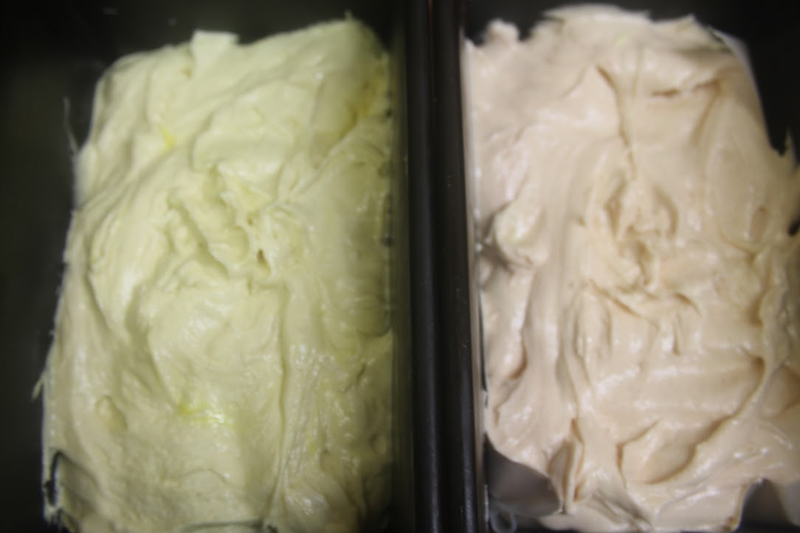 Cream the butter and sugar together until soft and creamy then add the beaten eggs one at a time with a tablespoon of flour to stop the mixture from curdling. Then add the vanilla essence and fold in the flour. Divide the mixture into two halves and color one pink and the other yellow by dropping the color in slowly until the desired color is reached. Do not over beat. Put into the prepared tins and bake for approximately 20-25 minutes. until firm and a cake tester comes out clean. Allow to cool then trim away the edges and cut into matching stick like pieces. You should end up with four yellow sticks and four pink sticks. Cut the marzipan in half and roll out between two sheets of baking parchment into a large rectangle. 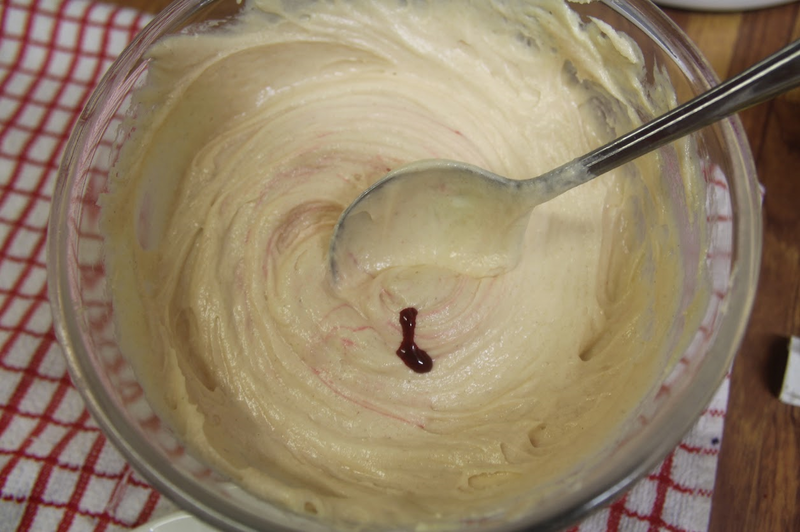 Warm the jam to make it easier to brush onto the cake and marzipan, then with the short end of the marzipan facing you – brush with jam. Place one stick of pink cake and one stick of yellow cake onto the marzipan and brush with jam, then place another stick of yellow cake onto the pink stick and a pink stick onto the yellow stick thus creating a checkerboard effect. 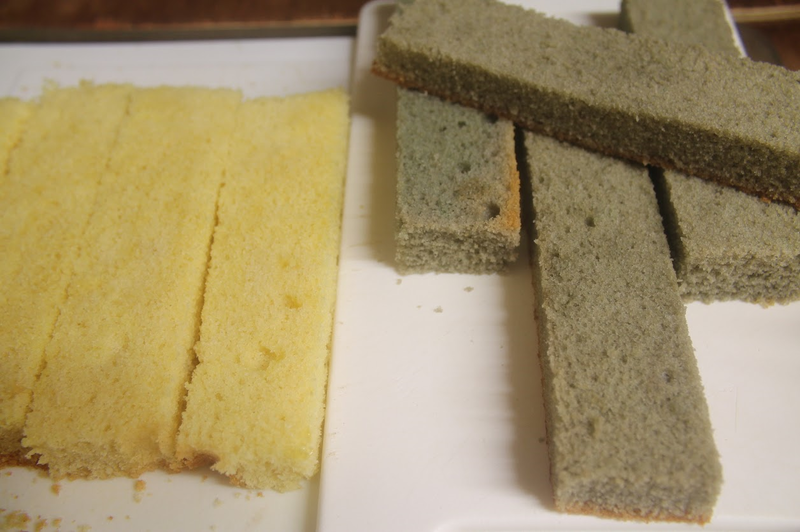 Brush the rest of the marzipan with the jam and roll the sponge up inside the marzipan carefully sealing the edges. Trim the ends and wrap in grease proof paper and pop in the ‘fridge to harden the marzipan so it will be easier to slice. Repeat with the second half of marzipan and the rest of the cake.